As much as I love Brighton, sometimes I do feel like I’ve exhausted all the coffee shops. Luckily for me London is just an hour away. However the issue is with London is that everything takes that little bit more planning and it’s not often I just happen to walk past good independent coffee shops in the city centre so a day trip means that some prior research is always involved. After looking online I decided to head to Shoreditch, East central London, which is apparently where all the cool people hang out. I’ve been to Shoreditch before but I feel like I’ve never really understood it. Sure, I’ve found a few vintage shops, some street graffiti and a couple of coffee shops but nothing like the hipster haven that it’s hailed to be online. Anyway this time I decided to do a bit more research and try to get to grips with the area. 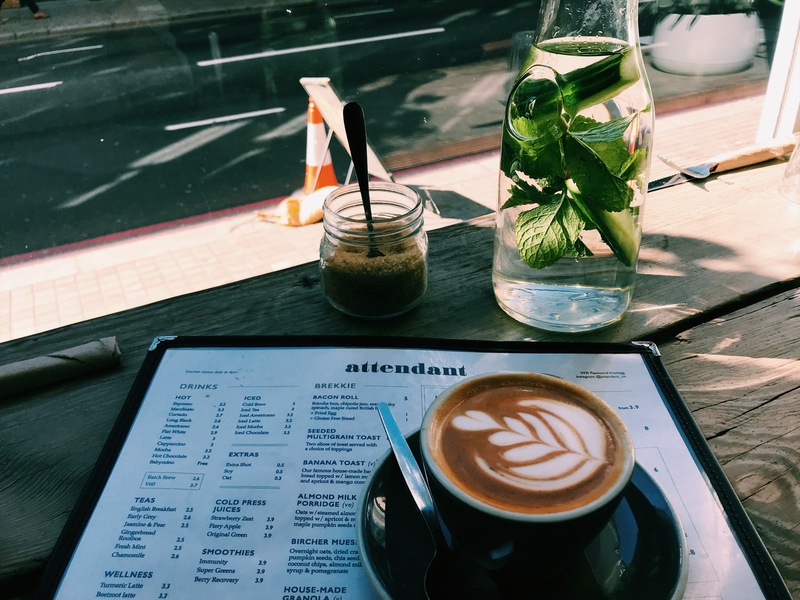 I decided to head to Attendant, a cafe that I’d read about online, hailed for its Australian style brunches and good coffee. The cafe was easy enough to find and I immediately fell in love with its arty and contemporary decor and chilled vibe. Undoubtedly it’s mainly a brunch with friends kind of place because the main seating area is dominated by large tables although it has nice window seats at the front that are good for solo coffee lovers too. The fact that you get seated in this cafe and pay at the end kind of put me on edge as it felt a little formal. Still the decor is fantastic. Clean, not grungy with lots of hanging plants and loads of space to relax. As I’m off travelling in Australia in a couple of weeks I thought I should save some money so I just went for a flat white. It was good and punchy and everything a flat white should be. At around £3 a coffee it’s pretty average for london prices and they bring over a bottle of cucumber water which is an added bonus. There’s a lot to choose from on the menu with all of the typical brunch dishes on offer like waffles, breakfast bowls and things on toast. If I wasn’t so stingy I would have probably gone for the house waffle with apricot compote, lemon mascarpone and meringue. Most dishes cost a reasonable £8. After pretending to be productive on my laptop and taking up one of the window seats for a lot longer than I should have, I set off exploring Shoreditch. I randomly bumped into one of my best friends and ended up making dinner plans, scouted out a whole load of cool graffiti, admired some very cool vintage shops but couldn’t find anything that I’d actually wear and ended up at Spitalfields market which was a quirky mismatch of fruit and veg stalls, fancy restaurants, more vintage stalls and a dancing flash mob: Ok Shoreditch, I totally get you now. Next The Wild Flour Cafe: How Cute Is This Campervan Cafe In Brighton’s Countryside?